AMD has just released a Crimson 16.4.1 driver update, which should improve the performance of Quantum Break PC for those using a Radeon R9 Fury X. The driver also adds support for the HTC Vive and Oculus Rift. Earlier today we reported on how the PC version of Quantum Break seems to be suffering from some serious performance issues, including framerate issues, stability, and more. While the report guys from a single individual running on a GTX980, it’s interesting to see that AMD has already released an update driver to increase Quantum Break’s performance on the R9 Fury X. Check out the release notes for the 16.4.1 updated driver down below. The driver can be downloaded by following this link. Upto 35% faster performance using Quantum Break™ on Radeon™ R9 Fury X than with Radeon™ Software Crimson Edition 16.3.2(1). Frame rate capping issues experienced in some DirectX®12 applications is resolved. Hitman™ may experience flickering when played in DirectX® 11 mode using high game shadow settings. Need For Speed™ may experience poor scaling or flickering in AMD Crossfire™ mode. As a work around users can disable the profile through the Radeon™ Settings game manager. The Division™ may experience flickering in AMD Crossfire™ mode. Power efficiency toggle in Radeon™ Settings is showing up for some unsupported products. XCOM2™ users may experience an application crash when using AMD Crossfire™ mode. As a work around please disable AMD Crossfire™ for the games profile in the Radeon™ Settings Gaming tab. Some DX9 applications cannot disable AMD Crossfire™ mode through Radeon™ Settings. A small subset of AMD Radeon™ R9 380 users may be experiencing slower than expected fan speeds. A work around is to raise your fan speeds through AMD Overdrive in Radeon™ Settings manually to a desired amount. HDMI Scaling options may not be available in Radeon™ Settings on some system configurations. 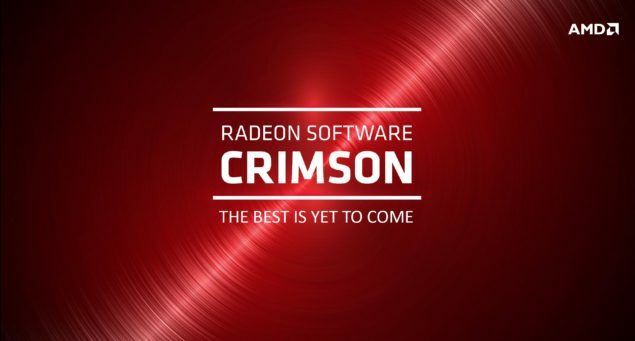 AMD Radeon Software Crimson Edition 16.4.1 Driver Version 16.15.2211.1001. The updated driver also adds support for the Oculus Rift, and the HTC Vive.